With the December 22 premiere getting closer and closer, Netflix has released two brief clips from their highly-anticipated Bright, showcasing the dynamic of two very different L.A.P.D. officers. The first clip features the orc Jakoby, played by Joel Edgerton, who gets quite excited when an "orcish" song comes on the radio, although his mood sours when Will Smith's Ward changes the channel, stating they will be listening to no orcish music. While the song definitely seems to be of the heavy metal variety, Jakoby protests, stating that it's one of the greatest love songs ever written, to which Ward replies, "That's a love song in prison." The second clip is much more mysterious in nature, featuring LAPD body cam footage, which is appropriately dated December 22, 2017, the same day the movie debuts on Netflix. The body cam footage shows Ward and Jakoby entering an apartment to subdue Lucy Fry's Tikka, one of the many mystical characters and creatures we'll see in Bright. A report from last year revealed that Ward and Jackoby work in a division of the L.A.P.D. dedicated to crimes involving magic, and that Tikka is an elf, who comes into possession of an ancient wand, which leads her to come under the protection of Ward and Jakoby. 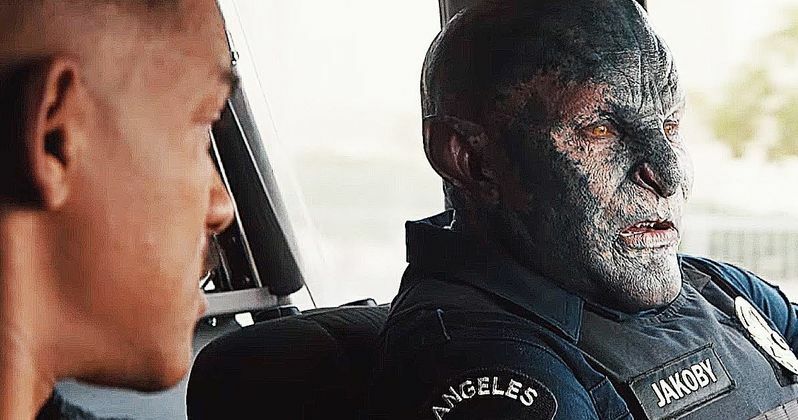 Netflix made headlines in March 2016 when they paid a whopping $90 million for Bright, which included $3 million for the script alone, written by Max Landis. The Netflix original film also stars Noomi Rapace, Lucy Fry, Edgar Ramirez, Ike Barinholtz, Enrique Murciano, Jay Hernandez, Andrea Navedo, Veronica Ngo, Alex Meraz, Margaret Cho, Brad William Henke, Dawn Oliveri, and Kenneth Choi. The film is directed by David Ayer and written by Max Landis. David Ayer, Eric Newman, and Bryan Unkeless serve as producers. The film will be released on Netflix on December 22, 2017. While Bright isn't arriving in theaters, it will arrive on Netflix during the last major box office weekend of the year, with Paramount's Downsizing, Sony's All the Money in the World, Warner Bros.' Father Figures and Universal's Pitch Perfect 3. Netflix also reached out to everyone named Will Smith to be a part of a unique marketing campaign, with other Will Smith's slated to fill in for the movie star Will Smith in promotional materials. While we wait for that unique campaign to get started, take a look at these new clips from Bright Twitter below.